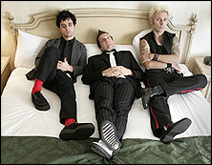 (CelebrityAccess MediaWire) — In response to the global appeal for aid in the earthquake and tsunami stricken areas of Eastern Africa and Southern Asia, Green Day, will donate to the American Red Cross International Response Fund all royalties from the iTunes sales of their number one single "Blvd of Broken Dreams" from the period of the record's release through the end of 2005. "This is the worst global disaster we've seen in our lifetimes," says Green Day's Billie Joe Armstrong. "We felt it was important to take part in the relief efforts any way we could."